This past week has gone by SO FAST! Barely had time to post on Wednesday and no time at all yesterday! It’s been pretty crazy, but I’m glad to be getting out of the house more. One of the reasons for us being away from the web yesterday was we signed on to do another awesome local holiday gift sale! 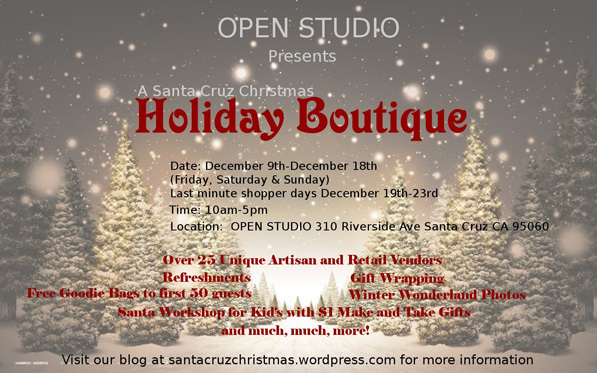 A Santa Cruz Christmas Holiday Boutique has turned their glorious house, that seconds as an Open Studio, into a beautiful place for vendors to display! What’s different than the gift sale we were involved with last week is that this holiday boutique is running until the 23rd, with many artist and some vendors being added every weekend. I leave for Atlanta next week, but Jack will be there for both of the other weekends. Come by and check it out, It’s gonna be a blast!